Anyone who has suffered the pain associated with kidney or gallstones will understand how disabling and traumatic this condition can be. Kidney stones are made from a compound known as calcium oxalate. This forms as a result of excess minerals dissolving around the inner lining of the kidneys. Most kidney stones are fairly small in size however some have been known to grow up to the size of a golf ball and often require surgery to be removed. Rather than calcium build-up, gallstones are made from a mixture of bile and cholesterol. They can often have no symptoms, however it can become extremely painful when a gallstone blocks the bile duct. This can often lead to infection and even jaundice. How does apple cider vinegar help? 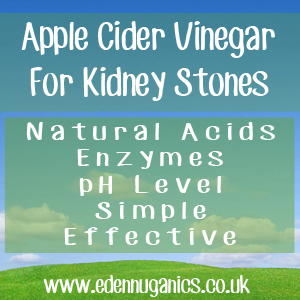 Apple cider vinegar is an extremely popular remedy for the treatment of both kidney and gallstones and has been shown to be effective time and again. How does it work? Well, ACV contains naturally occurring malic and acetic acid, both known to help dissolve stones over the course of a number of weeks, allowing the patient to naturally pass them and avoiding the need for surgery. In addition, apple cider vinegar lowers pH levels and helps to flush dangerous toxins from the body, often thought to form the base of kidney stones. When suffering from kidney stones, it is essential to start treating the problem as soon as possible as these painful calcium build-ups can be hugely disruptive to a normal lifestyle, often leaving sufferers bed bound and in need of painkillers. The Shot - The most basic and effective way of treating your kidney or gallstones using apple cider vinegar also tastes the worst. Simply fill a shot glass with apple cider vinegar (the raw, unfiltered type). Drink this back in one go. Be warned, you will want some form of chaser to hand as apple cider vinegar has a strong tart taste and leaves a burning sensation in your throat that may take some getting used to. The daily drink - The other option for those who don't fancy the idea of drinking neat apple cider vinegar is a far more pleasant tasting drink made from mixing ACV with warm water and a sweetener of your choice (we recommend Manuka honey). Step one is to warm some water in a pan. Make sure to only warm the water and not bring it to the boil as this will damage the apple cider vinegar. Next we add the sweetener as mentioned above. We highly recommend trying Manuka honey as this product of New Zealand is a natural honey that possesses powerful antibacterial properties due to naturally occurring levels of hydrogen peroxide. Now it's time to add the raw apple cider vinegar. Around 3 tablespoons to each 8 ounces of water should be sufficient. This mixture can be drunk twice a day, once in the morning before breakfast and again before bed. Not only will this help to dissolve and reduce any kidney stones, but also offer your body a wide array of benefits ranging from the pre-biotic properties of pectin to the unique way apple cider vinegar can help restore your body to its natural pH level. Apple cider vinegar comes in many different forms. A mistake often made by people just discovering this powerful health elixir is to purchase a cheaper bottle of pasteurised vinegar that is sadly void of many of the health giving properties. Pasteurisation involves heating the vinegar to extremely high temperatures as well as filtering it, removing any remaining enzymes and minerals. Instead, look for raw, unfiltered apple cider vinegar that has not been heated during the manufacturing process. Does Apple Cider Vinegar Soften Gallbladder Stones?